Early immigrant Morinosuke Kamizono, a familiar figure in the East Cape community of Te Araroa, died in 1938. Around this time, attitudes towards the Japanese hardened as tensions grew in the Pacific region. Kamizono’s children were brought up as Māori and learned nothing of their Japanese heritage. But as an adult in 1983 one grand-daughter began searching for her ancestors, and the quest culminated in a reunion in 2000. 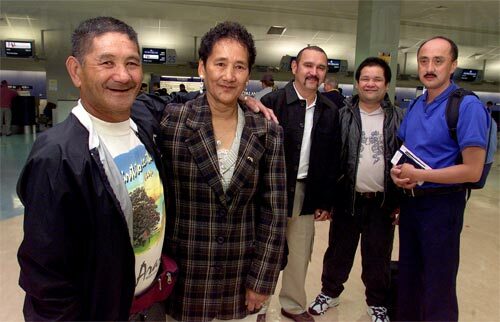 New Zealand family members (pictured here at Auckland airport) flew to Japan to meet with relatives in the fishing village of Makurazaki.